The Tracker 220 series of universal input indicators comprises a range of four models which offer unparalleled price and performance. The use of surface mount components and modern microprocessor technology has enabled powerful features to be packed into a standard 1/8 DIN case. The measurement performance is significantly better than that normally associated with indicators in this price range. The four models can be used for simple measurement-only applications or in more demanding situations requiring digital communications, alarms, maths functions and complex signal conditioning. The powerful menu-driven software enables fast flexible set-up from the front panel or via the serial communications interface. No adjustments of internal potentiometers, internal links or plug-in cards are necessary. 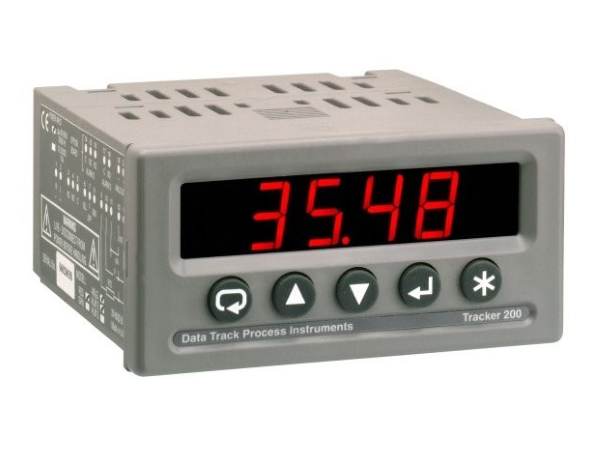 The tracker 220 series of Digital Panel Indicators are highly accurate with communications for temperature and process measurement. EN61010, IEC1010. Susceptibility: EN50082–2, EN50082–1.